In late-August, 2005, powerful Hurricane Katrina compromised an inadequate U.S. Federal levy system leaving 80% of the city of New Orleans under water. Among the over four-thousand displaced musicians was clarinetist Evan Christopher, a California native who first moved to the Crescent City in 1994. With little more than his clarinet and a suitcase full of clothes, Christopher chose Paris, France for his exile at the invitation of the City of Paris. During this artist residency, funded by an American program called French-American Cultural Exchange, he worked diligently to raise awareness about the musical culture of New Orleans through concerts and masterclasses. He also formed his own groups, the JazzTraditions PROJECT and Django à la Créole. For Django à la Créole, the idea was simple enough: Spice up the Hot Club texture pioneered by Django Reinhardt by emphasizing hallmarks of New Orleans Jazz including blues, rhythms of the monde Créole, and collective improvisation. The project debuted in August 2007 with performances in Great Britain and a small international jazz festival in Haugesund, Norway. As early as February 2007, Christopher began commuting back to the United States to work with touring New Orleans groups but in December, just prior to his move back to New Orleans, he made this recording. 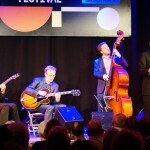 The quartet released the CD in New Orleans during the 25th anniversary of the famous French Quarter Festival. Girardot, he celebrates the music of the legendary Django Reinhardt and enlivens swing-era classics with fresh interpretations and virtuosic improvisation. 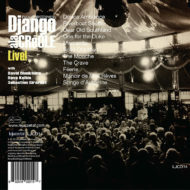 Their first CD, Django à la Créole was released to much worldwide acclaim. The 2nd, ‘Finesse’ was the 2010 Sunday Times jazz album of the year! Is there a more graceful band at work at the moment? New Orleans resident Evan Christopher has been called “not only the greatest jazz clarinetist alive, but one of the greatest of all time” by no less of an authority than Ahmet Ertegun, the founding chairman of Atlantic Records and, historically, a major figure in the recording industry. That is an impressive endorsement, but Christopher is an impressive musician. This is the latest recording by Mr. Christopher and the second by the group that he put together in Paris in 2007. It was recorded in December, 2009 and released in spring, 2010. 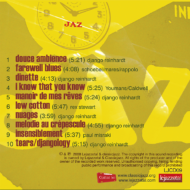 Like the earlier CD, this one simultaneously pays tribute to two traditions: the distinctive Gypsy swing of the great guitarist Django Reinhardt (especially his quintet that included clarinetist Hubert Rostaing) and the Creole clarinet tradition of New Orleans and the French Caribbean islands (especially Martinique). As has been the case for the past decade or so, Evan is heard on an Albert-system clarinet bequeathed to him by fellow clarinetist Kenny Davern. This recording opens with a Sidney Bechet composition that Christopher renders in an unmistakably Caribbean clarinet style. That is followed by the title track, a lovely composition here attributed to Ellington bassist Billy Taylor, which features an interpretation by Evan that brings to mind a Latinized Barney Bigard. Moving on, a Christopher original, named after the band itself, reveals an interesting amalgam of the two traditions. “It’s based,” he says, “on three themes from Django’s solo, Improvisation No. 3 (parts 1 & 2), that I arranged in the manner of Jelly Roll Morton’s ‘Spanish Tinge’ pieces like The Crave.” The rhythm – a tango or habanera – is again in the Latin idiom. Indeed, Latin rhythms abound in this recording. 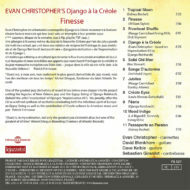 In addition to those already mentioned, there is the tasteful samba feel that Evan gives to one of his favorite Reinhardt-Rostaing outings, “Songe d’Autumne.” Nineteenth-century New Orleans composer Louis Moreau Gottschalk was the first to combine European forms with Afro-Caribbean rhythms, and Evan here revisits the composer’s “Creole Eyes,” a piece he first recorded with pianist Tom McDermott nearly a decade ago. The CD concludes with a tip of the hat to Brazil once again with Bechet’s “Passport to Paradise” rendered as a choro, a musical style that Christopher and McDermott often visited in their several “Danza” collaborations. The program also includes a couple of good old Hoagy Carmichael evergreens, a couple of Ellington-influenced standards (I loved the bluesy shuffle of Rex Stewart’s “Solid Old Man” which features more of the Bigardian spirit), and another Reinhardt original (“Féerie”) that showcases Evan’s—indeed, the whole group’s—ability to negotiate a difficult number at breakneck speed. They’re really cooking on this one. Mention of “the group” clearly requires that kudos be given to David Blenkhorn for his excellent solos on both accoustic and electric guitar and the solid groove laid down by Dave Kelbie and Sébastien Girardot. Combined, these four talented young musicians have given us a delicious taste of a different form of French cuisine, and I can heartily recommend it. 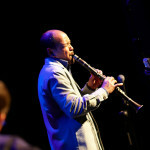 The epithet “flawless technique” does not even begin to describe Evan Christopher’s manner of playing, perhaps, the most challenging reed instrument: the clarinet. His polished intonation is marked by the perfect annunciation of the notes that gush forth from his clarinet sometimes at great speed. His rhythmic attack is so full of surprise, especially when he injects elements of Brazilian and other Latin American colorings into the long, loping lines he plays. 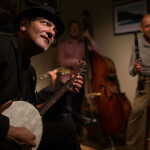 He has a spiritual connection with Django Reinhardt and the Romani tradition of Europe, and it is as deep and enduring as the one he shares with George Lewis, Barney Bigard, and the magicians in the New Orleans Creole tradition. This is beautifully brought out in the swaggering glissandos and with tremulous wonder in the stately version of “Mood Indigo” that he and the quartet play on the memorable Finesse, a joint release by lejazzetal and Fremeaux & Associates, in France. It is Christopher’s reverent sense of history that enables him to revisit the work of New Orleans’ great legendary son, Sidney Bechet. The album opens and closes with the great clarinetist’s “Tropical Moon” and “Passaporte ao Paraìso.” His rendition of Bix Beiderbecke’s bustling masterpiece, “Riverboat Shuffle,” is a snorter. His own “Django à la Créole,” which is based on Django’s solos on “Improvisation No. 3 (Parts 1 and 2),” melded into Latin pieces played by that other master of the New Orleans idiom, Jelly Roll Morton. This remains the centerpiece of this second memorable album that brings Gypsy music together with jazz from that charmed era, cooked in the place of its birth, New Orleans. Throughout this magnificent album, Christopher’s control over melodic content is matched by his inspired use of harmonic ingenuity. 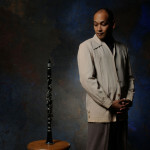 On songs such as “Finesse,” “Féerie Eyes” and “Mood Indigo,” it sometimes feels as if Christopher has a hidden reed in his clarinet, which enables him to create a harmonic force that adds density to the colors he is able to paint, from a palette already rich in hues from the luscious tones that he is able to draw out of his beautiful woodwind instrument. Christopher’s genius emerges further as he fuses together musical idioms from the Caribbean, Brazil and Cuba into the Creole world of New Orleans with rare finesse and charm; more than that, it’s the clarinetist’s ability to create all this in an environment that is at once reverential as well as completely new and timeless, so that it appears wholly new. Christopher’s mission is enhanced by the accompaniment on his journey from three other musicians equally passionate about the roots of swing: guitarists Dave Kelbie, who has almost single-handedly kept the flame of Gypsy music burning brightly—not only in Europe, but also in the rest of the world—and the talented David Blenkhorn, who plays his Django-like role to perfection throughout; and the remarkable bassist Sébastien Giradot, who contributes more than solid rhythmic accompaniment, brilliantly showcased on the spectacular title tune of this album of rare beauty. Enregistrement raffiné, magnifiquement spatialisé.Finesse est un bon titre. Il rend parfaitement compte de la qualité première de cette musique, qui pour être d’une belle fraîcheur et d’une réelle originalité, se donne à entendre de façon privilégiée et choisie à travers le chuchotement, le raffinement mélodique, la souplesse des timbres. Mariant avec bonheur l’univers des séances haïtiennes du clarinettiste Sidney Bechet, la souplesse des petites formations ellingtoniennes, la musique créole, voire le choro brésilien, avec l’univers de Django Reinhardt, ce quartet d’une élégance à toute épreuve charme immédiatement. D’abord parce que la musique créole et la biguine ont une histoire en France. Ensuite parce que Sidney Bechet et Django Reinhardt furent aussi de grandes vedettes françaises. Enfin, plus important encore, parce que cette musique en demi-teintes, parfois presque diaphane, réveille au sein de notre mémoire musicale parfois assourdie ces magiques soirées de Pigalle où convolaient en justes noces le tango et le jazz, le musette et l’afro-cubain, où régnaient entre autre Robert Mavounzy, Sidney Bechet lui-même et Al Lirvat. Evan Christopher mérite toute notre admiration à l’écoute de ce disque enchanteur, sa musique comparable à nulle autre semblant faite de l’étoffe dont sont faits nos plus beaux souvenirs. On ne trouvait que chez le grand clarinettiste argentin, Giora Feidman, une telle suavité à la clarinette, comme cette rare faculté de fondre en un style musical singulier, comme le fait Evan Christophe, le talent personnelle et la mémoire des peuples. Excellent clarinettiste, aux idées claires et aux mélodies limpides, il sait mélanger habilement Sidney Bechet et Django Reinhardt, avec un quatuor acoustique au son délicieusement rétro appelé Django à la Créole. Ca sonne bien sûr manouche, mais aussi la Nouvelle-Orléans, La Havane et Rio. Le son du guitariste soliste David Blenkhorn s’approche dangereusement de Gabor Szabo; Christopher, quant à lui, ne flirte qu’avec la perfection et le groupe d’être toute subtilité et nuances. Intitulé Finesse, c’est un Cd d’une rare beauté dans un créneau où foisonnent les imitations et les clichés. Après un hommage bien senti au guitariste Django Reinhardt, grand patron du jazz manouche et des secrets harmoniques, le clarinettiste Evan Christopher revient avec son ensemble Django à la Créole. Né en Californie, mais établi à la Nouvelle-Orléans, ce jeune interprète (36ans) a fait ses classes au cœur même d’un jazz traditionnel. Pour éviter le déjà-vu, il a revu avec ses complices et de façon sublime 121 pièces qui ont fait époque. Cette nouveauté tout en finesse est un cadeau de première main pour qui voudrait connaître les fondamentaux du jazz en long et en large. Plus qu’un plaisir, c’est une autre manière de réentendre le sel d’un art qui perdure avec, en premier lieu, Riverboat Shuffle (Hoagy Carmichael), Féérie (Django Reinhardt), Mood indigo (Bigard/Ellington) et le méconnu Passaporte ao Paraiso, de Sydney Bechet. Usant des timbres et des couleurs (un vrai peintre, ce Evan Christopher), il fait ressurgir ici et là les ombres de Barney Bigard, Benny Goodman, Maxim Saury, Mezz Mezzrow et Sydney Bechet comme il se doit. Une rentrée sous le signe du soleil ! Evan Christopher s’est taillé un franc succès avec son Django A la Créole et il aurait bien tort de ne pas récidiver. L’idée reste la même : mêler les effluves néo-orléanaises de sa clarinette au parfum de jazz manouche. Comme si Bechet avait rencontré Django, qui aimait la clarinette mais ne joua jamais avec le plus français des Louisianais. Jamais incongrue, mais au contraire d’une grande fraîcheur, cette Finesse a tout ce qu’il faut de délicatesse, d’indolence et de charme pour n’être pas usurpée. Evan Christopher nous propose dans cet album, Django à la Créole, une sorte de musique mythique de la rencontre manquée de deux géants de la musique du XXème siècle, Sidney et Django, sur lesquels planent l’ombre tutélaire de Duke Ellington et les regrets éternels de Charles Delaunay, deux acteurs majeurs de l’histoire du jazz. Ces deux hommes, pour l’un, en tant que musicien, pour l’autre en tant que promoteur de leur art, avaient en commun d’avoir immédiatement discerné le génie de Bechet et de Reinhardt. Dans Music Is My Mistress, Duke présente Sidney, qu’il engagea pendant trois mois dans son orchestre en 1924, comme le plus grand musicien de jazz et comme un véritable génie de la musique (qu’avait déjà révélé Ernest Ansermet dans un fameux article de la Revue de la Suisse Romande de 1919). Il découvrit également Django pendant sa tournée européenne de 1937 et l’invita à rejoindre son orchestre après la Seconde guerre, à la fin des années 1940. Ses deux tentatives avec ces deux artistes d’exception furent vouées à l’échec. Quant à Charles, les relations qu’il a laissées, dans Delaunay Dilemma, de son expérience de producteur avec ces deux musiciens, elles établissent des réalisations pour le moins difficiles ; et n’eussent été son amour du jazz et son admiration pour le talent musical des deux hommes, les carrières de ces deux personnages auraient certainement tourné court. Evan Christopher reprend des pièces des deux maîtres ou qui ont constitué des jalons importants de leur discographie respective, qu’il réintègre dans le langage imaginaire de l’autre : « Finesse », « Solid Old Man », « Improvisation n°3 »…sont des enregistrements historiques du guitariste manouche ; « Tropical Moon », « Passaporte ao Paraiso », sans être les plus connues, sont des compositions signifiantes de la créolité de Bechet ici célébrée. Les autres œuvres ont été jouées à l’occasion par eux ou, tout au moins, auraient pu l’être. Et le talent de Christopher et de ses amis a été de recomposer un univers puisé dans la culture propre de chacun. Evan est un clarinettiste d’exception, mais il n’a pas l’expressivité de Sidney sur cet instrument ; il interprète les pièces « en référence à » mais dans sa manière propre et avec beaucoup de bonheur. David Blenkhorn ne refait pas Django. Influencé par l’école américaine de la guitare, il évoque les compagnons de Nat King Cole (Oscar Moore, Irving Ashby, John Collins…) et son style n’est pas sans rappeler celui de Mike Reinhardt. Dave Kelbie a un accompagnement moins pesant que celui de la tradition manouche, ce qui confère beaucoup de légèreté à cette musique parfaitement soutenue au niveau rythmique et harmonique par un Sébastien Girardot aussi discret qu’efficace. En sorte que, sans « refaire du Bechet ou du Django », les musiciens ont, dans leur langage personnel, reconstruit un Bechet authentiquement américain mais ensemencé de latinité, et un Reinhardt étranger au blues et cependant nourri de jazz : rencontre probable et néanmoins impossible de deux civilisations fortes : avec pour résultat un dialogue agréable. Dans le livret de présentation, Philippe Baudouin s’étonne de ce que Bechet et Reinhardt, vivant et travaillant tous deux à Paris au début des années 1950, n’aient jamais sinon joué, du moins enregistré ensemble. Mais au-delà des problèmes de contrats évoqués, je crois pouvoir, sans dévoiler de grands secrets, rapporter les propos de conclusion de Charles Delaunay, auprès de qui j’ai eu l’occasion de m’ouvrir de ce rendez-vous manqué impardonnable ». Ces musiciens étaient certes géniaux mais ils étaient surtout « impossibles et s’aimaient beaucoup, aucun ne voulant laisser la vedette à l’autre dans ce type de réunion ». On trouve la confirmation de cette réalité dans Delaunay Dilemma, Charles écrit à propos de Django (p. 107-108) : « Mais pour un personnage aussi orgueilleux, cette impression amère de ratage américain brouillait toute perspective d’avenir ». Quant à Sidney, qu’il admirait tout autant, ses appréciations ne sont guère plus amènes : « caractère changeant et ombrageux…méfiant…Il avait un côté homme de la terre, à la fois rude et madré… » (p. 187). Or s’il était un homme susceptible de provoquer cette rencontre, tant par son entregent, que par ses compétences musicales (il fut le catalyseur de la rencontre avec Grappelli, des enregistrements avec Coleman Hawkins, Benny Carter, les musiciens d’Ellington – Barney Bigard, Rex Stewart…, dont plusieurs pièces sont ici reprises – avec Dickie Wells…) ou par ses activités professionnelles (rappelons que Charles faisait partie de l’équipe dirigeante de Vogue, où enregistraient Django et Bechet pendant cette période, qu’il avait conservé des relations privilégiées avec Django et qu’il était l’impresario de Bechet), c’est bien Charles Delaunay, qui par ailleurs avait ses entrées auprès de tous les acteurs du secteur phonographique. Malgré sa représentativité et son pouvoir de persuasion, il ne parvint jamais à convaincre ses interlocuteurs ; « ils avaient un sacré caractère ! », disait-il. Django à la Créole a les saveurs de mets improbables, les parfums incertains des illusions nostalgiques mais les bruissements de la belle musique. 11 titres qui surprennent car c’est un mélange assez sympathique entre le jazz, le tzigane et celui des airs d’Amérique du Sud. Ce CD commence et finit par Sidney Bechet, arrangé entre ses amours Django et des airs Brésiliens. Evan Christopher à la clarinette, David Blenkhorn à la guitare, Dave Kelbie à la guitare rythmique et Sébastien Girardot à la contrebasse, tous de très bons musiciens qui nous rappellent ces boites enfumées de la rive gauche où des musiciens tels que Bechet, Luther et autres virtuoses de jazz emportaient le public jusqu’aux lueurs du petit matin. Voilà, nos amis nous ont concocté plus d’une heure d’un petit mélange musical entre Sidney Bechet et Django Reinhardt. Ceci me rappelle ma jeunesse ! Très bon disque. Nouvel épisode d’une expérimentation qui fit mouche voici deux ans : la rencontre d’une section rythmique de style manouche et de Evan Christopher, clarinettiste habité et voluptueux sur lequel plane l’ombre du grand Sidney Bechet. Finesse est le titre qui convient exactement à ce second disque tout en exquise délicatesse, qui s’évade – mais pas totalement – du répertoire reinhardtien pour explorer d’autres rivages, plus proches qu’on l’imagine : choro brésilien, danzón cubain et délicieuses raretés néo-orléanaises signées Jelly Roll Morton ou Louis Moreau-Gottschalk. Brillantissime. Ah ! Le hasard, quand il le veut, quand il n’est pas paresseux, il fait bien les choses. Quand il décide de tordre le cou à la nécessité, il les fait drôlement bien, les choses. Tenez, plus haut, on vous cause de Stéphane et de Django, et là, figurez-vous qu’on va continuer. Car avant de publier le Quintessence, Frémeaux & Associés ont publié un nouvel album de cet extraordinaire clarinettiste qu’est Evan Christopher. Le titre? Django à la créole. Dans le texte de présentation, Philippe Beaudoin explique qu’au fond, ce disque, c’est la rencontre rêvée entre le Créole néo-orléanais Sidney Bechet et le Manouche Django Reinhardt. «Tous deux habitaient Paris, et se sont sans doute croisés entre 1949 et 1953 […] Bechet enregistra Nuages, le tube de Django, douze jours après la mort du guitariste.» Toujours est-il que le programme choisi est la traduction sonore du rêve évoqué: Tropical Moon de Bechet, Finesse, Riverboat Shuffle, Django à la créole de Christopher, Solid Old Man, Songe d’automne, Jubilee, Creole Eyes, Féérie de Django, Mood Indigo de Duke Ellington et Passaporte ao Paraiso. C’est pas alléchant, comme programme, ça? En tout cas, l’exécution de ces morceaux fichtrement bien choisis n’est évidemment pas alléchante puisqu’elle ne peut pas l’être. Mais purée! C’est bien foutu. C’est impeccable! C’est impeccable à la puissance 10. Sur un instrument réputé difficile, Christopher manie la retenue avec sensibilité de manière admirable. Il est d’autant plus à l’aise que ceux qui l’accompagnent sont des contradictions des deux de pique: David Blenkhorn et Dave Kelbie aux guitares et Sébastien Girardot à la contrebasse. Autrement dit, ce Django à la créole est aussi joyeux que le Grappelli, avec un je-ne-sais-quoi de soyeux qui le distingue. C’est bon, tout bon. 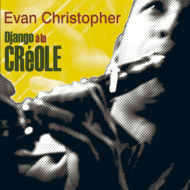 New Orleans based clarinettist Evan Christopher’s initial “Django A La Creole” recording was released in 2008 and was included in the Sunday Times “Best 100 CDs Of The Year” listings, coming in at no. 9 in the jazz section. 2010’s follow up “Finesse” has done even better with the paper naming Christopher’s follow up as No.1 jazz album of the year. “Django A La Creole” has now become the name of Christopher’s band with the same personnel remaining from the previous recording. Joining Christopher on clarinet are guitarists David Blenkhorn (lead) and Dave Kelbie (rhythm) plus double bassist Sebastien Girardot. This is a stellar line up also capable of delivering excellent live performances (reviews of the previous album and of a concert given at Builth Wells are to be found elsewhere on this site). “Finesse” appears on the French Fremaux Associes label and is released in conjunction with Kelbie’s London based lejazzetal organisation. 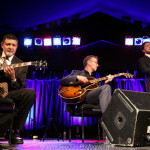 As before it’s an exciting fusion of “Hot Club” guitar stylings with the music of New Orleans. Christopher is inspired as much by Sidney Bechet as by Django Reinhardt and he and his group serve up a fresh and tasty variation on the Reinhardt legacy. “Finesse” shows the Django A La Creole group at their best. The playing throughout is warm and skilfully executed and the choice of material makes for an interesting and innovative exploration of the Reinhardt legacy. If memory serves it’s also better recorded than it’s predecessor with every nuance of Christopher’s fluent and expressive playing superbly captured by producer Kelbie and engineer Dylan Fowler. Despite the release on a French label the album was actually recorded at Fowler’s studio near Abergavenny. This may not be the most challenging of releases but the warmth and skill of the playing and the imagination of the arrangements makes for hugely enjoyable listening. In the hands of these guys it’s easy to see why the Django Reinhardt style has remained so enduringly popular. There must be an awful lot of musicians who are kicking themselves for not having dreamt up the concept for Django a la Creole, the quartet which fuses the gypsy jazz style and line-up with that of the traditional New Orleans jazz clarinet. Why? Because it’s such a brilliant and inspired mix – and one which, certainly on the evidence of Wednesday’s jazz festival concert at The Hub, is utterly seductive and widely appealing. 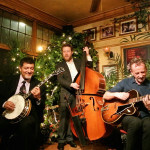 The members of the band may live in different countries, but over the course of two albums and regular tours they have clearly established a terrific relationship, yet sparks still fly when they play – and, as with the original recordings of Django Reinhardt and Stephane Grappelli, the atmosphere is of sheer joie-de-vivre. On Wednesday night, they dished up one thrilling treat after another – from a lovely repertoire that ranges from 1850s New Orleans to Hoagy Carmichael classics. Of course, much of the appeal of this uniformally top-notch band is the gorgeous and downright mesmerising clarinet playing of the flamboyant Evan Christopher who injected drama and New Orleans-style colour into every tune. As with the late, great Kenny Davern, Christopher has a flair for the theatrical (both musically and, rather distractingly, in his stage presence): in Davern style, Christopher played such quieter numbers as Mood Indigo and Solid Old Man in the lower register to begin with before exploding into a soaring flight of fancy, after holding back and almost lulling the audience into expecting that the whole tune would be soft and gentle. 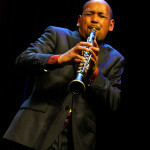 There’s no finer clarinetist in jazz today than Evan Christopher. While his style is clearly in the Swing camp, he’s no mere revivalist. He’s a talented composer and improviser, as well as a remarkably proficient instrumentalist, exploring new paths within a traditional framework. 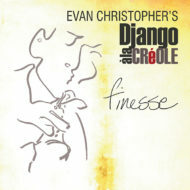 Finesse, by Christopher’s Django à la Creole trio (with guitarists David Blenkhorn and Dave Kelbie and bassist Sébastien Giradot) is a somewhat harderswinging affair that also covers plenty of Bechet, mixing his New Orleans flavor with the gypsy swing of Django Reinhardt. The album opens and closes with Bechet tunes, packed in between with Swing Era (and earlier) gems by the likes of Reinhardt, Rex Stewart and Hoagy Carmichael. The group handles all these tunes with poise and dexterity, whether it’s Reinhardt’s frenetic “Féerie Eyes” or Duke Ellington’s timeless ballad “Mood Indigo”, given an especially beautiful treatment here. 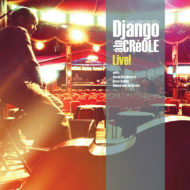 The lone original, and the tune that gives the group its name and sums up its purpose, “Django à la Creole”, is based on Reinhardt solos that Christopher says he arranged in the manner of New Orleans master Jelly Roll Morton’s Latin tunes. Disciple de Barney Bigard et Edmund Hall, Evan Christopher s’est taillé un franc succès avec son « Django à la créole » en mêlant les effluves néo-orléanaises de sa clarinette au parfum des guitares manouches. Comme si Sidney Bechet avait rencontré Django, lui aussi aimait la clarinette mais ne joua jamais avec le plus français des musiciens louisianais. Leur « finesse » a tout ce qu’il faut de délicatesse et d’indolence pour n’être pas usurpée.